Rain Deer Star = Ho, ho, ho ! 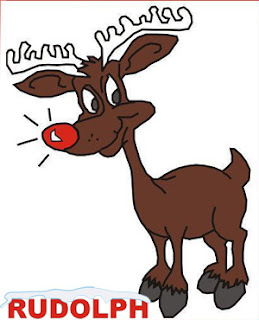 Rudolph the red-nosed reindeer has a very shiny nose! Ho, ho, ho....! R = Ci resta male.... mentre le renne giocano a palla, lui le osserva e chiede =May I play with you? Rain = No, you may not. R = May I play with you? Deer = No, you may not. R = May I play with you? Please....! Rain Deer Star = No! Rain = Because you can' t you can' t play, so you may not play. Rain = No, you cannot. R = Yes, I can. I can play. May I play? Rain = No, you can' t. And you may not. R (piange) = May I play with you? Rain = Because you have a red nose! You are different.... you are strange! SC = Ho, ho, ho ! It' s a foggy night, tonight. I can' t see so well.... (SC si accorge di Rudolph, gli va vicino e gli chiede ) = Hello, Rudolph. Why are you crying? R = Because I may not play …. SC = Oh, yes. You have a red nose. ( SC pensa e ha un' idea … Rivolto a Rudolph …) Rudolph, with your nose so bright …. can you drive my sleigh tonight? R = Oh, yes! I can! Thank you, Santa. SC = Thank you, Rudolph.... ho, ho, ho... Let' s go! Rain Deer Star = Oh, Rudolph! You can guide! OH ! R = Yes, I can. And I may! … I may ! ….. I may!